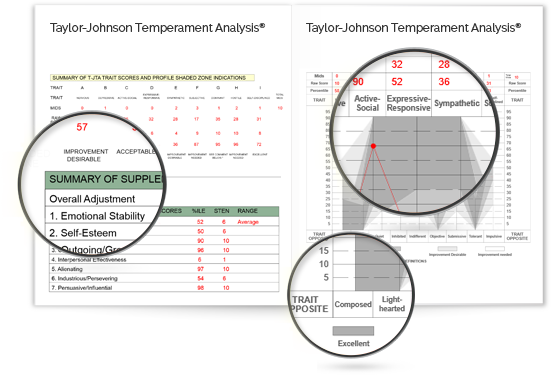 The Taylor-Johnson Temperament Analysis®(T-JTA®) is a widely used personality assessment for individual, pre-marital, marital, and family counseling. 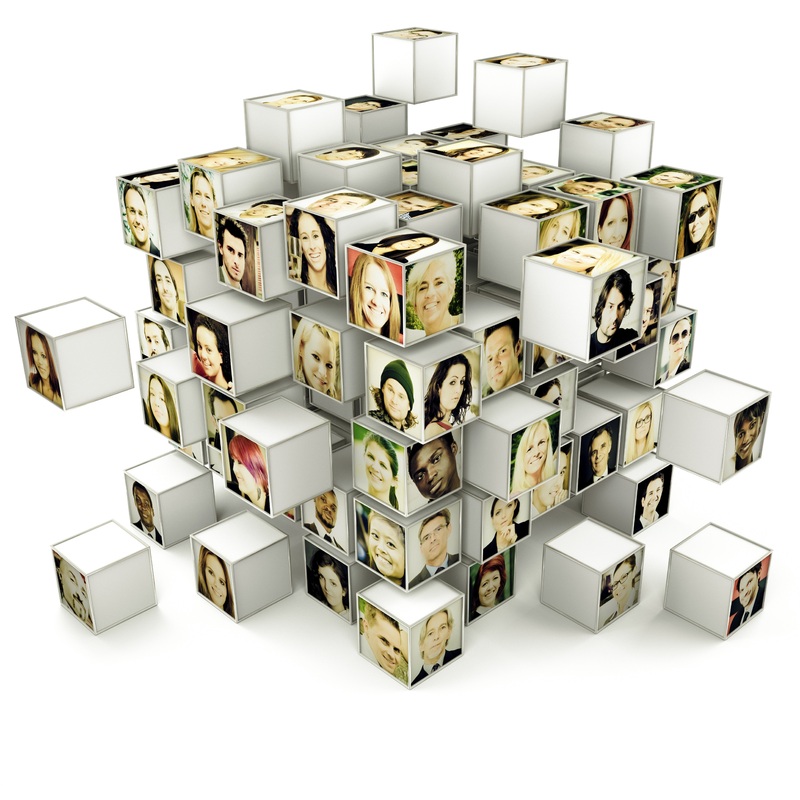 The T-JTA measures 18 dimensions of personality (9 bipolar traits) that are important in individual adjustment and interpersonal relationships. For over 50 years, the T-JTA has been used by hundreds of thousands of counseling professionals in a wide array of settings in the U.S. and around the world to help people understand themselves and others in their lives. Illuminating: Identifies problems that are difficult for clients to articulate, fostering awareness and insight. Accessible: Produces graphical results that are easy for counselors to explain and clients to understand. Efficient: Brings to light core issues and establishes rapport within hours instead of months. Flexible: Can be taken online using any internet-connected device, or offline using paper materials. Like an emotional x-ray, the T-JTA Profile displays in graphical terms the landscape of one’s temperament. Its visual presentation is immediately accessible and communicative to clients, making it an ideal visual aid for use within the counseling session. Combined with detailed counselor reports, the T-JTA gives you results that are equal parts concise and comprehensive. For both counselor and client, the T-JTA accomplishes in one sitting what can otherwise take months to achieve. 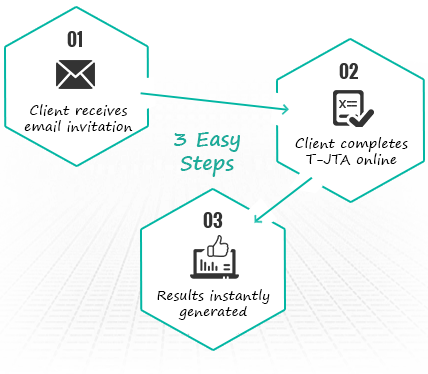 With T-JTA Online, Testing is as easy as 1-2-3. Client logs in to testing website.  Client completes the T-JTA on any computer, phone or tablet. You recieve test results within one business day. Apply now to become a T-JTA Authorized Practitioner. Copyright © 2018 T-JTA. All rights reserved. Please contact us at 800-345-8378 for assistance in locating a T-JTA Practitioner in your area.